Home > Terminology - Loan > The MCLR rate is used as a benchmark rate for...! The MCLR rate is used as a benchmark rate for...! Marginal Cost of Funds based Lending Rate (MCLR) rates. 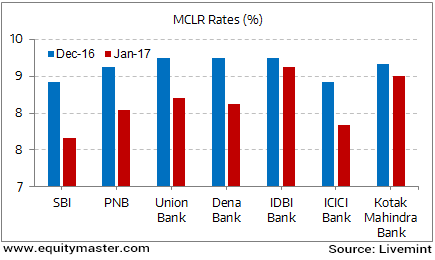 The MCLR rate is used as a benchmark rate for new loans. Essentially the banks are now aggressive on the rates cut in the hope of riding on some credit growth. The Reserve Bank of India (RBI) data suggest a slowdown in India's credit growth. This is languishing at 5.8% year on year. Flush with bucket loads of cash in the system which has helped in reducing cost of funds for the banks, some of the banks have in turn reduced their lending rates. Interest Rates Finally Headed Down South? The overall impact of this rate cut on stimulating credit growth remains to be seen. However, one important aspect that is over looked by everyone is the impact of chasing growth on the bank's bottom-line. An aggressive cut on the lending rates while keeping the deposit rates relatively higher would impact banks profit margins. The present drive though seems firmly towards boosting credit growth and bringing more business to the banks.